Countries across the world face serious challenges around how to manage an ever increasing elderly population. The extra burden on the healthcare infrastructure is just one issue. Having an ageing population has meant a restructuring of pension systems and there’s extra pressure on tax payers who have reduced as a percentage of the population. The UK and China face many similar challenges in delivering high-quality and cost-effective health care for elderly people. In October 2014, David Gray, our China specialist, and I led a mission to China, organised by UK Trade and Investment, Healthcare UK and the China-Britain Business Council. It was a chance for British elderly care providers to meet with investors, local care deliverers and local governments to share experiences and forge commercial collaborations for the benefit of both countries. Of course, the situation in China has been influenced by the country’s one child policy brought in to control population growth in 1979. The policy is currently being relaxed, but the unforeseen consequence has been an arguably even more serious problem with an unbalanced population. The comparison with the UK is interesting. In 2010 17% of the UK’s population was aged over 65 compared to 8% in China. By 2050 the figures are expected to be 24% and 26% respectively. It is estimated that China will need about 10 million nursing home beds and an elderly care workforce of 10 million. The government expects the beds to support about 3% of the population with 7% cared for in residential settings. The majority will continue to be cared for at home. At Healthcare UK, we have built a strong relationship with partners in China, and we are working together to offer solutions. Our five-day trade mission saw ten delegates representing 20 different organisations visit the cities of Chengdu (home to the Giant Panda Research Station), Kunming and Shanghai. The UK delegates came from four key focus sectors of industry and commerce – representing UK expertise in design and programme management of facilities, service operation, training and education and digital healthcare services. Among the delegates was Dr Katherine Baker from Northumbria University. She was representing a range of educational facilities in the UK examining opportunities for further education partnerships between China and UK. China is looking to explore how UK educators can provide training for healthcare workers in China, provide better training for trainers, how it can help devise curriculums, develop training materials, introduce ‘flying faculty’ from the UK, and offer post graduate training. There’s also the possibility of research collaboration on subjects like dementia, health in old age, treatment, care and rehabilitation. One thing we were all interested in finding out about was China’s move towards building high-end retirement villages and services. Shaw Healthcare’s chief executive Jeremy Nixey was on the visit to discuss the nursing and care services it provides. Shaw runs its own care homes, as well as helping people to live independently in the community and providing more specialist services for complex care, dementia and mental illnesses. And it was very useful to have Dr Hui-Chi Yeh, China director from IT specialist TPP along with us. TPP is a UK company which has particular expertise in the efficient collation and sharing of medical records. Its aim is to ‘join up’ healthcare based on a shared electronic medical record, improving access to clinical data and empowering patients to take part in their care. This is particularly important in providing quality elderly care, where patients are often cared for in multiple settings and whose independence can be supported through technology. On the infrastructure side, global construction consultancy Gleeds joined the delegation. Gleeds already has strong links with China. It was appointed consultant to the pioneering National Demonstration Healthcare Project in Guizhou province comprising Hospital and Elderly Care facilities. It was fascinating to hear how public-private partnerships will create these developments, most of which are at an early stage, and to discuss what contribution UK businesses might make in the future. During out week, we met with elderly care developers and investors, operators and colleges. And we identified 27 opportunities for collaboration and potential joint ventures. In some cases, this was progressing projects that were already identified – others were new. It is clear that China’s growing demand for healthcare is on a scale that the world has never before seen and will require a large and complex system that can satisfy the needs of the population. 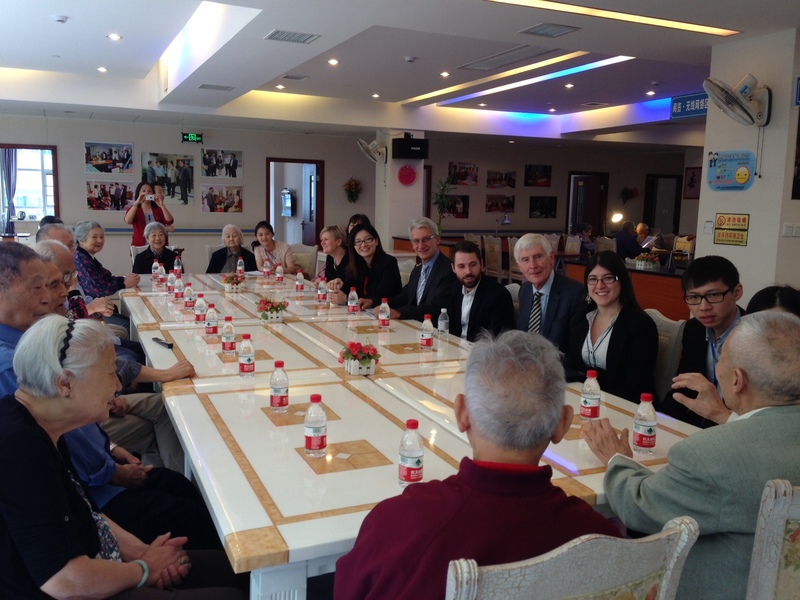 We saw on our trip that the Chinese government realises this and is undertaking an ambitious reform programme to make sure elderly people receive the right care at the right time in the right setting. We saw some examples of this care in a Langli (Long Live) home in Chengdu and Changshou (Longevity Road) in Shanghai. They showed how people could be respectfully looked after in their own or a residential home setting near their community. For example, in Shanghai, the home was above a leisure centre and fresh food market. Healthcare UK is already doing a great deal to help broker partnerships in China. Please feel free to get in contact if you are interested in finding out more.